Backup camera, blind spot monitors, power seat with power lumbar, keyless entry with remote start, automatic headlights, fog lights, automatic dimming mirror, compass, outside temperature, A/C, power windows/locks/mirrors, AM/FM/MP3, auxiliary and USB port, steering wheel mounted audio controls, Bluetooth, tilt and telescopic steering wheel, cruise control, information center, 17" alloy wheels. Fuel Economy: 27 city / 39 hwy. Warranties: Balance of Nissan's 5 year or 60,000 mile powertrain. In service date: 12/29/2015. Extended service contracts available. The 2018 Nissan Altima comes in five trim levels: 2.5 S, 2.5 SR, 2.5 SV, 2.5 SL and 3.5 SL. 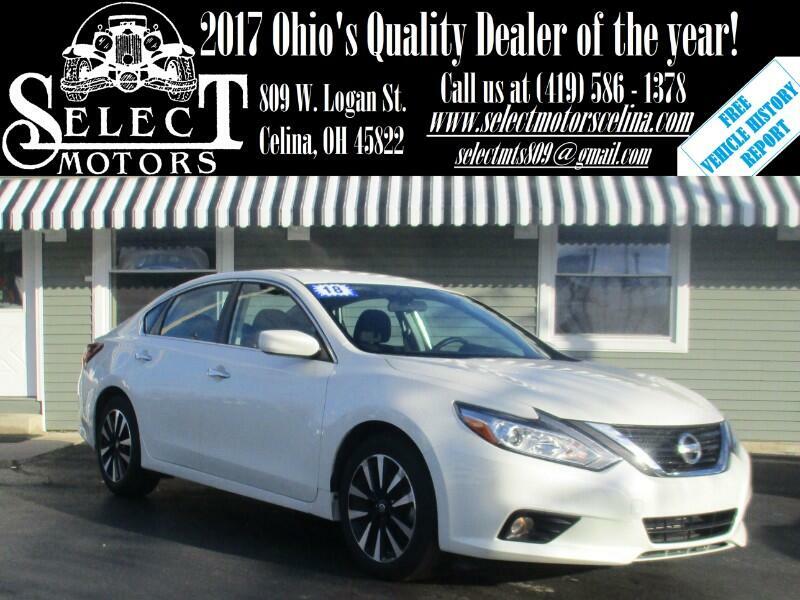 All Altimas (except the 3.5 SL) are powered by a 2.5-liter four-cylinder engine (179 horsepower, 177 pound-feet of torque) that routes power through the front wheels through a continuously variable automatic transmission (CVT). Standard features for the 2.5 S include 16-inch steel wheels with plastic covers, a rearview camera, keyless entry and ignition, a height-adjustable driver seat, 60/40-split folding rear seats, Bluetooth, a 5-inch display screen, and a six-speaker audio system with a USB port. Also standard for 2018 is a forward collision warning system with automatic emergency braking. The sporty 2.5 SR trim upgrades the 2.5 S with 18-inch alloy wheels, daytime running lights, foglights, a rear spoiler, a sport-tuned suspension, a leather-wrapped steering wheel, paddle shifters (with seven simulated shift points), upgraded upholstery and a power-adjustable driver seat. Compared to the 2.5 S, the 2.5 SV trim has 17-inch alloy wheels, LED daytime running lights, remote engine start, blind-spot monitoring with rear cross-traffic alert, dual-zone automatic climate control, satellite radio and the SR's foglights, power driver seat and leather-wrapped steering wheel.